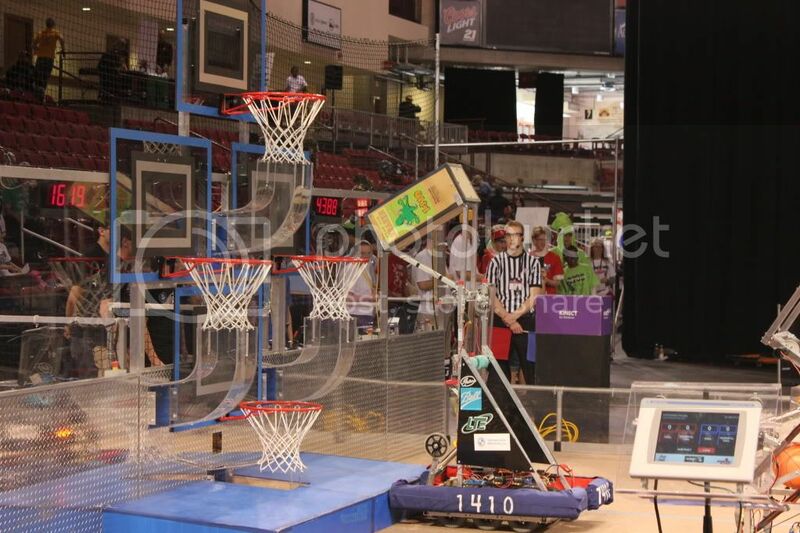 Our 2012 robot was designed for the game “Rebound Rumble” a basket-ball-esque game in which robots try to score on different sized hoops. More information about this game can be found HERE – on the game information section of the website. This robot, the Kraken, was a defensive powerhouse, able to score 10 points in autonomous and then play solid defense with a 24:1 gear ratio. For speed, the robot could switch gears (literally) into a 9:1 gear ratio for speed and agility. Able to traverse both the bump and the bridge with ease, the Kraken was designed to be the most agile, and most powerful robot on the field. With 6 pneumatic wheel, you get amazing traction on the bridge, and with the dropped center, it was still easy to turn. During the FIRST Colorado regional, the robot seeded 9th, driven by David Chan, WIll Murphy, Patrick Lutz, and Sam Chen (with some assistance from Matt O-Neil and Nate Bloom) and was the captain of the 6th seeded team composed of team 1410, team 3200, and team 1619.